So an application came in with Rocky NY2 as the first preference... And when asked what drew the applicant to Rocky, he said "We just wanted to rescue a senior dog that was being overlooked by other adopters." He had written in is app "We love boxers and we have a great setup. Can't imagine an adult boxer without a family. Can't imagine our family without a boxer. Rescuing is a tribute to two of the greatest dogs on the planet (our formers, of course)." And so it goes that way sometimes. We had no luck for Rocky for more than seven months, and than he hits the jackpot! 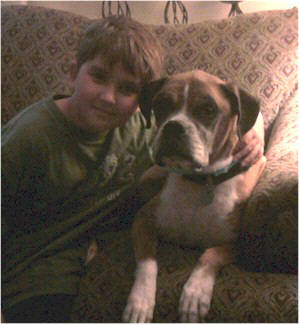 Richard and Doreen have two of the biggest hearts around, and wanted to give Rocky the forever home he so deserves. Rocky warmed the hearts of every volunteer that met him, and now he's warming two of the biggest hearts we've met. Richard, Doreen and Rocky know what it means to really rescue a dog. Thank you! Rocky NY2 is ready for his forever home. 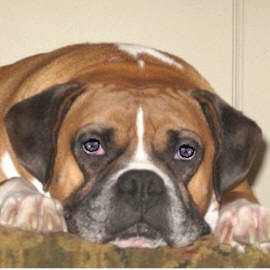 The perfect home for 8.5 yr old Rocky would be with retirees or someone who is home a good portion of the time. He's easy to walk, but has plenty of pep, and loves to fetch balls. He loves car rides, and loves going out with his humans for summer dining at outdoor restaurants, meeting and greeting passerby's and their pooches. His separation anxiety is now under control with the use of a crate. Rocky has learned to find comfort in his crate when his human has to go out for a while. To meet Rocky is to fall in love with him. Please consider Rocky for your family. Everyone who meets Rocky just falls in love with him. He is great in every way except he needs someone who is around a good part of the time. I take him to work with me and he is very calm and quiet all day laying on his bed under my desk. He also is great in the car! He loves going for rides and as long as the weather is right, I can leave him there while I go for short errands. And while the weather was nice, Rocky would join us at outdoor restaurants that allowed dogs to be at the table. He just took in the sites and sniffed the dogs that were constantly passing by our table. 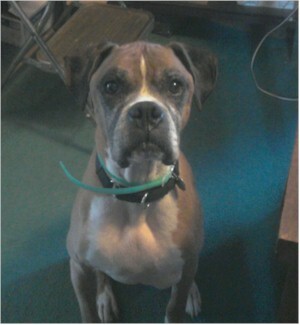 Rocky would fit into a senior's home, or a "work from home" home, or someone who can take their dog to work with them. We are working on training him to be ok when he is alone, and we've made a lot of progress, but he is not ready to go "Cold Turkey" being by himself for a lot of hours. Do you have a big enough heart to include this wonderful dog in your life? We have some new pictures of this handsome guy. Rocky's great with kids and has a new best friend with Matthew. They played ball together, and Rocky knows how to bring the ball back and sit before running and fetching the ball again. He also entertains himself with a ball acting more like a 2 or 3 year old than the 8 year old he is. He was at the Commack Petsmart Adoptathon this past weekend, and was great with big and small dogs, and all the kids and adults that wanted to meet him. We were set up next to a cat rescue, and Rocky wasn't phased at all by the cats and kittens right next to him. 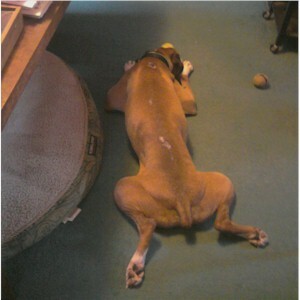 Rocky comes to work with me and is very content just to relax under my desk, or as you can see in the photo (right), he stretches out (I call it "long doggin it"), and chews on a tennis ball or bone. Rocky is doing well with his SA training, and needs someone who will continue the progress he has made in a very few short weeks. Please consider this great guy for your family. If you are interested in adopting this dog, please fill out an online application first. Then e-mail the contacts below. Be sure to include your full name, city, state, and area code in the subject line of your message.